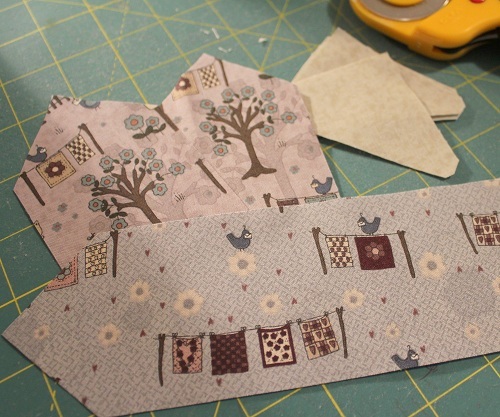 It’s funny – I really do not enjoy piecing! But when I do piece, I like all my points to match up, at least appear to do so. I think it’s the researcher (my job in my former life) in me that comes out when dealing with precision in my piecing. 1. Since 99.9% of my currents quilts are designed on the computer first, I get to print off the templates on paper. Technically I can then transfer the shapes onto a piece of craft plastic. 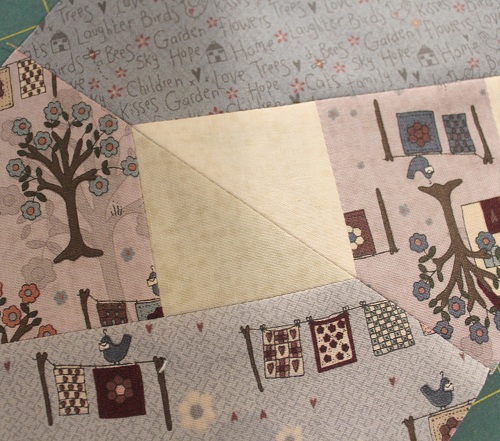 And then, I would use pencil to trace the templates shapes onto the back for a fabric piece…. BUT I am a little paranoid about my pieces not being precise as I would like. You see, it probably doesn’t really amount to anything (I am sure it really doesn’t in the grand scheme of things), but I feel like tracing with the pencil around the plastic template will add just a minutely teensy weensy of excess compared to just cutting the shapes right on the edge of the shape. So, the very short answer to the question of whether I use plastic sheets to make my templates is “no”. I use the template as printed on the paper, as shown. The picture shows my paper template before the first cut. You will see the actual template shape (solid line), seam allowance (dotted line), and that I just rough cut around the seam allowance. 2. Then, I attach pieces of tape on the backside of my paper template. 3. Then I place my paper template on the fabric that is pressed nice and smooth before hand. The tape will temporarily hold down the paper template while I cut out the fabric piece to shape. 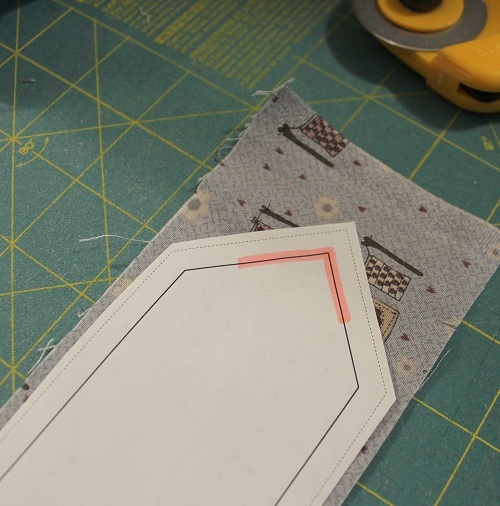 Now, remember I said I prefer to cut my fabric right on the edge of the shape… you see that solid line that is highlighted pink? That is the RIGHT ON edge of the shape with which I will base my cutting. I don’t go by that seam allowance dotted line when I cut. 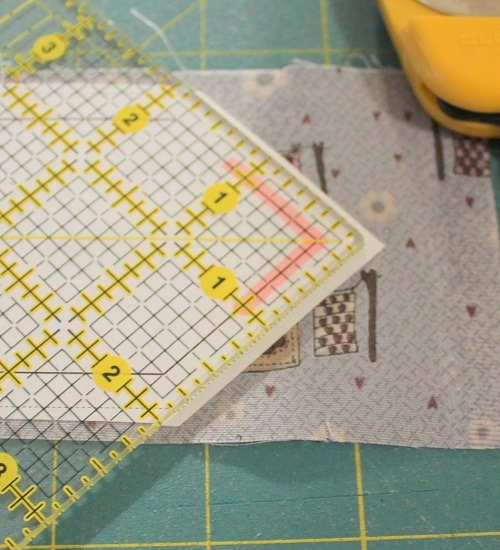 I line up my ruler RIGHT at the 1/4″ seam allowance ON TOP of the template edge, and cut my fabric piece. In other words, I trust the 1/4″ on my ruler a little more than I trust the 1/4″ printed on the paper. No, I am not saying the 1/4″ seam allowance printed the paper isn’t accurate, but every so often, maybe because of the paper being pull through the printer, I do detect a very very very slight discrepancy. 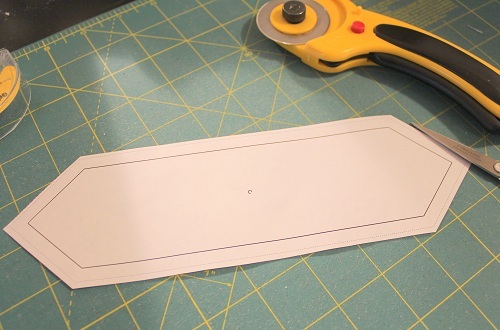 I figure I trust my ruler’s 1/4″ mark when I rotary cut anyway, might as well use that same idea for template cutting my fabrics too. 4. And then, I duly cut my fabric piece to shape (and getting rid of the excess paper from my rough-cutting the template shape). And I cut all my pieces that way for this particular block. I make my blocks (lots of them! 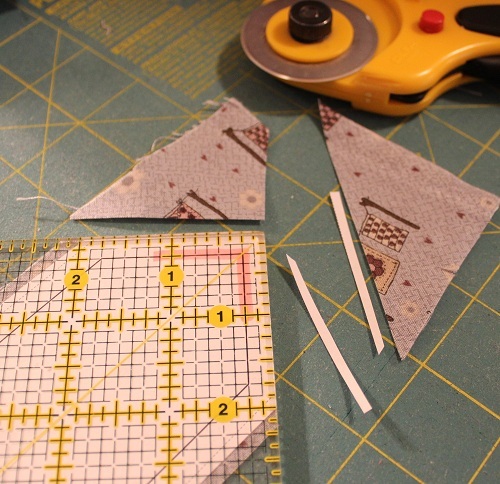 ), and sew them together… and am really happy with these points where the blocks meet! 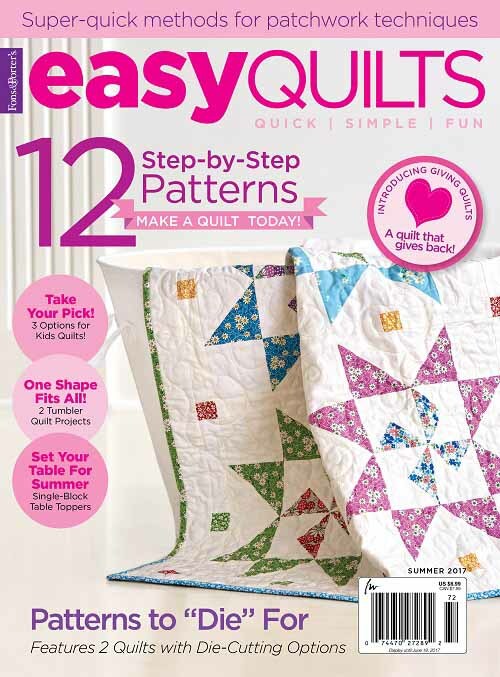 This entry was posted in Freebies, Ideas, Tutorials, Quilting and tagged Template Piecing Method. Bookmark the permalink. I love the idea of using tape on the back of the template. 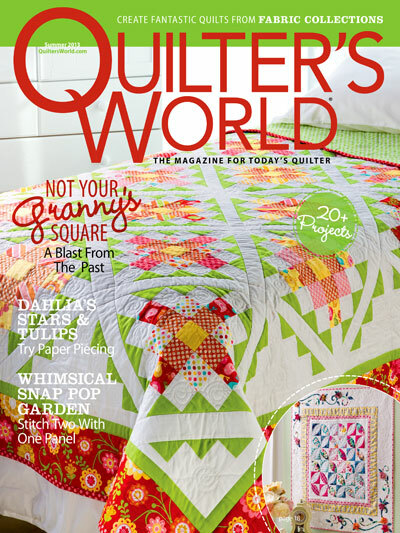 In all my years of quilting, I never thought of that. Learn something new every day! This looks like it would work fine for me although I’ve not sew with many templates. 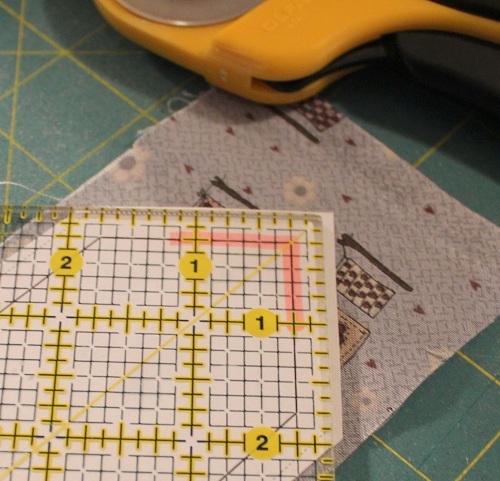 With my paper piecing, I measure just like you did for the 1/4 inch for the same reason. Your piecing is always excellent!! The tape is a wonderful idea. Why didnt I think of that? You are so helpful! Can I ask what fabric you are working on here? I loveeeee it. Hmmm…I never tried this method. I would usually make cardboard template and then cut by fabrics. This seems like a blend with cardboard/template plastic and paper piecing. Do you sew on the paper too? No, I never sew on paper when I do template piecing, but would at times when I do paper piecing. Even then, I do the folding the seam line method to avoid sewing on paper when I paper piece. That way, I don’t have to print out 50 paper pieced templates. Great tips for using templates. Thank you. 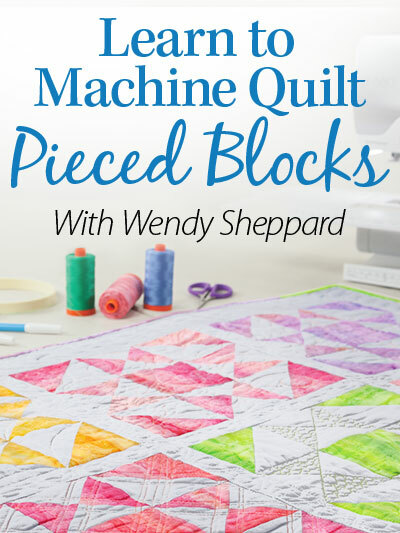 Your process makes a lot of sense and great for perfectly cut pieces. I use several different methods depending on the shape and complexity of the pieces. 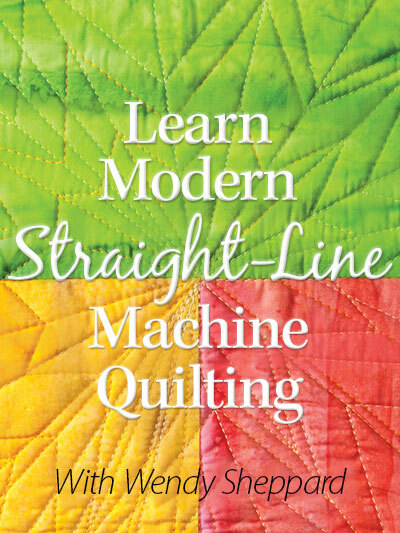 I’m a quilter with an engineering degree too (BSME for me). I’m always aware of that pencil width too so I like this idea of using paper templates. I have an idea to try – something similar with freezer paper. I’ll print the template with freezer paper in my computer. Then rather than tape I can iron on the template before cutting with rotary cutter. I am just starting to use the templates so I think I’ll try both ways and then choose the way that works best for me. I’m not sure I understand. It seems as though you would be using a ream of paper for a quilt (or do you print several templates on one sheet of paper?). Great question. No, you don’t… you just print one template, and then reuse it for the rest of your cutting. 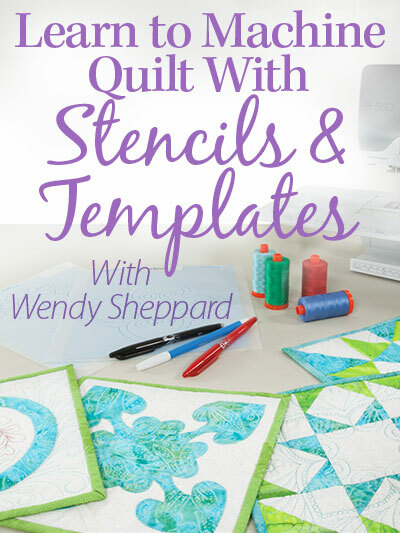 Wendy, have you ever tried printing your templates onto 8 1/2″ x 11″ sheets of freezer paper? I heard that recommended once for machine applique. 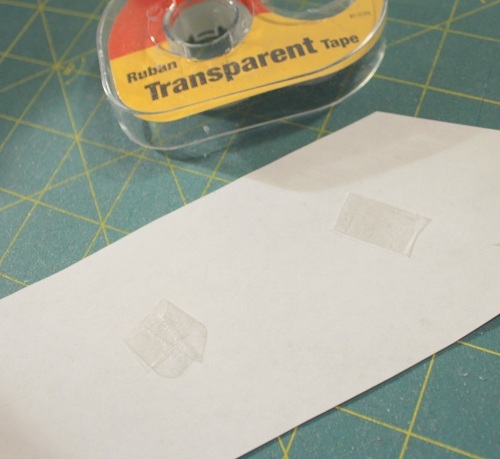 It would eliminate the tape and virtually eliminate any possibility for the paper template to shift when you’re rotary cutting, since you can temporarily adhere that freezer paper to your fabric with a warm iron. Just a thought — I personally have never tried putting freezer paper in the printer. If it melted in there, my husband would freak out because he uses our printer for work! Do you know if you can get freezer paper already cut to size like that, or do you need to cut the sheets off the roll that you get from the grocery? 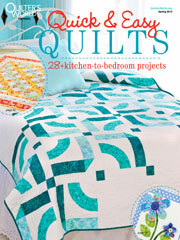 Rebecca, you can get packs of 8 1/2 x 11 sheets of freezer paper at any quilt shop. It works well in ink jet printers, I don’t know about laser printers. I haven’t tried this method, but it looks like it would be very accurate! Thank you so much for sharing your tricks and methods – I have learned a lot from your blog! Isn’t it just amazing what we all share and learn? I am printing this information and putting it with my patterns for the next time I have to use templates. Wendy your precision is wonderful, love that your corners match perfectly!! You are so like me in that I don’t like piecing and I get upset when things don’t match up as they should. 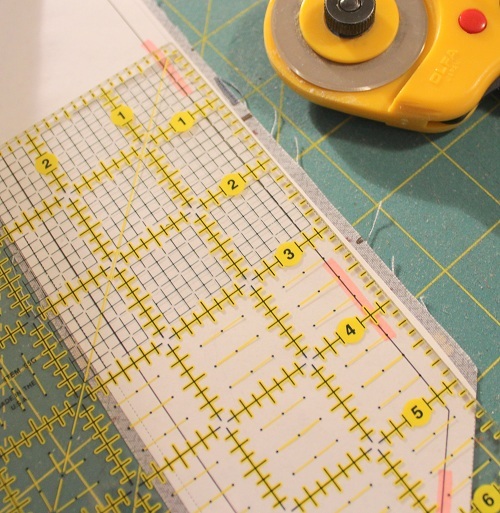 Thanks for sharing how you make piecing more precise and fun. find some to purchase? Thank you. I have just found your website and this post – I have a different system of using templates with straight edges – having used them and over time bits of the templates get shaved off and the whole piece gets wonky – so I cut my paper templates out without the 1/4 seam allowance, then I use my “add a quarter” ruler, butting the edge of my template (often doubled or reinforced to make a nice crisp edge) up to the ruler, then cutting. This gives me a good seam allowance, and my paper templates can be used over and over again w/o damage.